My first encounter with Key Lime Pie was in one of the opening scenes of the film Natural Born Killers. 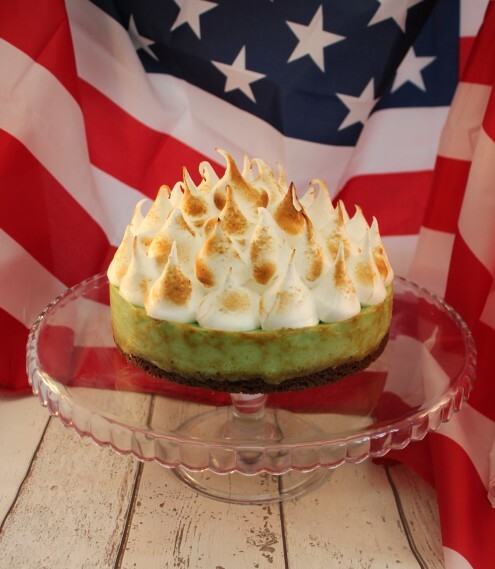 Our anti-heroes order Key Lime Pie of the most Technicolor vivid acid green dessert that caught my eye more than the action itself – I cannot really recall this diner scene OTHER than the pie! I have combined two other dessert favourites in the creation of my Key Lime Pie; firstly, I have used chocolate chip cookies in my buttery biscuit base as I love Chocolate Lime Sweets. Secondly, I have used an Italian Meringue on the top of the pie in the same way as I would for a Lemon Meringue Pie. You could use freshly whipped double cream as an alternative topping if you prefer. Crush the biscuits thoroughly and stir them in melted butter until completely coated. Press the damp, sandy rubble firmly into the bottom of a lined cake tin and bake in a pre-heated oven for 30 minutes. Set aside to cool completely. To make your lime centre, zest the limes into a large bowl and squeeze all of the juice from each one. Add the yolks of 8 large eggs (retaining the egg whites from 4 of these for your meringue) condensed milk and lime extract if you have it. Stir your lime centre ingredients to combine and add a little green food colouring paste if you would like to create a vivid green centre. Always opt for a professional quality food colouring paste as you will not need to add much and it will not fade too much during baking. Pour the lime centre into the cake tin on top of your cooled biscuit base. Return the tin to the oven and bake for 25-30 minutes until set with a pleasing wobble. Allow to cool completely – this will take at least 2 hours at room temperature, though can be left overnight if you want to do this the day before. To make your Italian Meringue, dissolve caster sugar and water in a small saucepan and bubble to 118°C over a high heat. You will need to use a sugar thermometer to monitor this accurately and to create the perfect meringue – this is well worth a fiver for taking the guess work out of this task. Once the sugar reaches 100°C, whisk the egg whites on top speed until they hold stiff peaks. This should happen just as the sugar reaches 118°C. Pour the hot sugar syrup into the egg whites whilst the mixer is whisking slowly – the syrup will incorporate quickly into the egg whites and a further 5 minutes of slow whisking results in stiff, shiny peaks of meringue. Pipe or spread meringue on top of your lime centre and finish with a flourish of flames from a chef’s blowtorch… or under the grill, though this is far less dramatic.